Kevin Munz, the developer/restaurateur who brought world –class dining to the Bay Area with Cullen’s American Grille, is once again raising the community’s culinary bar with the addition of kitchen master David Coffman to his staff. Coffman, the self-taught chef who has blazed his way through some of Houston’s most imaginative restaurant operations, has taken command of the kitchen at Cullen’s American Grille. 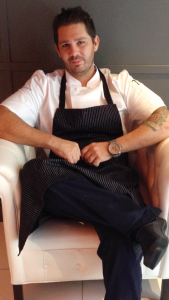 In September, Munz, Cullen’s owner, and his General Manager Ryan Roberts finalized their agreement with Coffman and placed him in charge of their restaurant, catering and banquet operations as Executive Chef. Coffman will also assist with the development of Bravissimo!, a new Italian cuisine concept conceived by Munz and Roberts which is scheduled to open in a space adjacent to Cullen’s this fall. Munz, whose Clearpoint Crossing development has brought new construction and a dozen new businesses to the land adjacent to Cullen’s, hopes local residents will regard him and his enterprises as neighbors. In the last twelve months, Munz and Roberts have upgraded and expanded the restaurant’s meeting and conference space, renovated the main dining area, and established a world class bar whose selection of hundreds of bourbons and scotches has earned it a listing on Great Bourbon Bars of America. Ryan Roberts shares Munz’ enthusiasm for Coffman, whose culinary pedigree boasts service at Houston restaurants including Katsuya, Benjy’s, 17 Restaurant in the Hotel Alden, The Tasting Room and Goro & Gun. The Dallas-born Coffman says he is ready to take Cullen’s to the next level.